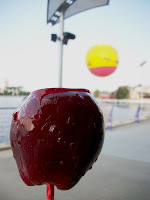 Candy apples must be a mid-west/east coast thing, never heard of them until I watched a Food Network show on Candy apples. I can't find them out here on the west coast. Am I missing something? ?